Christine had entered the Clarendon Half Marathon this year but, as the day approached, her achilles was still playing up and, with a week to go, she transferred her entry to me. Stood on the start line I was in something of a quandry as how to tackle the race: I had done no preparation this time but last time I had run I had won! On top of this, the first 1km is the flattest of the course so you can’t waste it easing yourself in. As it was, I set off somewhere near the back of the top 10 and at a pace which didn’t feel excessively fast. I had been undecided over footwear too as my off-road shoes are disintegrating. I’d eventually gone with road shoes which was the right choice as the conditions under foot were the best I’ve known them. Indeed, it was a glorious day with lots of blue sky and a nice cool breeze. When we reached the climb up to Farley Mount at 7 miles I can’t claim to have been feeling particularly strong but there was the incentive of a steady stream of marathon runners to pick off. Although you’re only just over half way when you reach the top, mentally it feels like you’ve broken the back of the race. I overtook a couple of my fellow half-marathon runners as I descended to where my fan-club was waiting to cheer me on and this gave me sufficient impetus to continue pushing to the end, despite the nasty undulations in the last 5k. 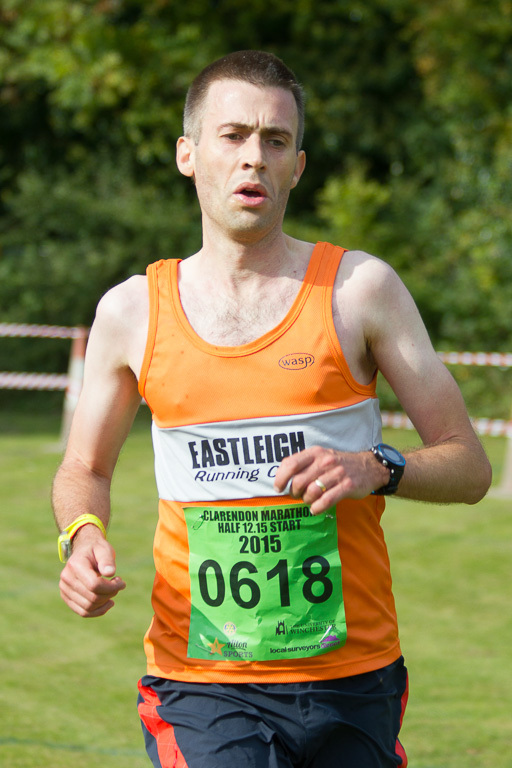 I eventually finished in just over 1:28 which was only half a minute slower than my previous winning time. Even that wouldn’t have been nearly good enough this year with the winner taking an impressive 1:20. I was more than satisfied with my 5th place though and I’ve only been hobbling slightly today! This entry was posted on Monday, October 5th, 2015 at 9:10 pm	and is filed under Running. You can follow any responses to this entry through the RSS 2.0 feed. Both comments and pings are currently closed.